The Devon Orchid Society exists for the organisation of activities related to the cultivation of orchids by its members. It holds monthly meetings and puts on an annual show. 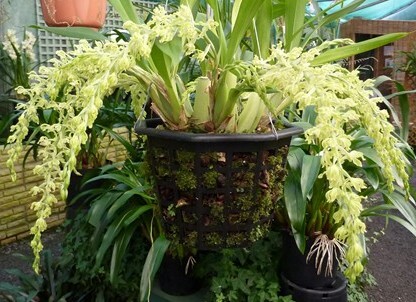 It also organises a larger orchid weekend, normally every two or three years . There is a monthly newsletter providing information on the Society's activities, with reports on meetings and details of prizes awarded at shows and annually for success at monthly meeting displays. The newsletter contains cultural tips and other information of interest to orchid growers. Monthly meetings are held at Burnham Nurseries, Forches Cross, Newton Abbot, Devon TQ12 6PZ (just off the A38 between Newton Abbot and Bovey Tracey), usually on the third Sunday of each month starting at 2pm. Members enjoy free entry to Burnham Nurseries' Orchid Paradise, a display house with many beautiful and unusual orchids always on show. The meetings' programme includes presentations from professional and amateur growers about orchids and their culture and related subjects. There is a display table for members to show their orchids, with points awarded by experienced judges. There are opportunities for members to discuss successes and failures and orchid culture problems, thereby obtaining the advice of experienced growers. Usually twice a year auctions of plants are held, giving members the opportunity to sell their surplus plants and buy other different or more unusual plants at reasonable prices. The Annual Show is held in May; in 2018 it was held at the Public Hall in Budleigh Salterton. Displays are mounted by several orchid societies as well as Devon, and orchid nurseries also have plants for sale. Orchid advice is available and potting demonstrations are given. Refreshments are also available. In 2019 our Show will be held on Saturday 4th May at the same venue. 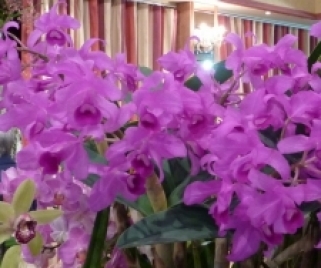 An Orchid Weekend, normally held every three years in October in Dawlish Warren, was held on 18th and 19th October 2014, with thirteen societies showing and eight orchid nurseries, four from overseas attending. We very much regret to announce that, due to an unforeseen and significant increase in costs, the Orchid Weekend we had planned to hold in October 2019 is no longer financially viable and has had to be cancelled. More details of our shows can be found on the Shows page.